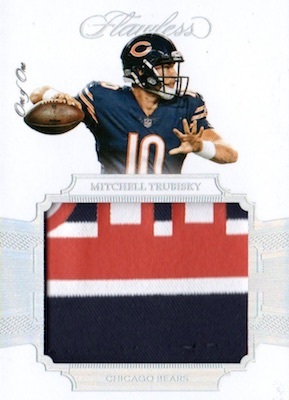 The ultimate in high-end NFL collecting, 2017 Panini Flawless Football expands the coverage while still keeping to low print runs. Instead of a box, collectors have a metal briefcase that includes six autographs and two each of memorabilia and gem cards. Just as in 2016, individual print runs don't exceed 25 copies. 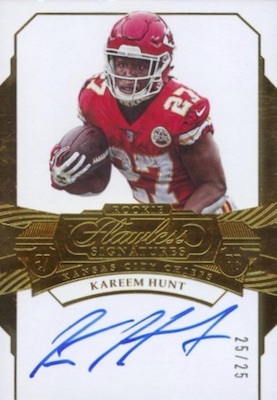 In addition, all 2017 Flawless NFL autographs are hard-signed or display cut signatures, and there are many new inserts and signers. With 2017 Panini Flawless Football, all that glitters is not gold. In many cases, it's actually diamonds and other precious stones. The jewel cards come two to a box. Base Gem cards, limited to 15 copies, add several low-numbered parallels. Choices include Sapphire (#/15), Diamond (#/10), Emerald (#/5), Chocolate Diamond (#/4), Canary Yellow Diamond (#/3), and Platinum (1/1) editions. Going patriotic, the Red, White and Blue Gem cards feature a color-coordinated, three-jewel lineup. 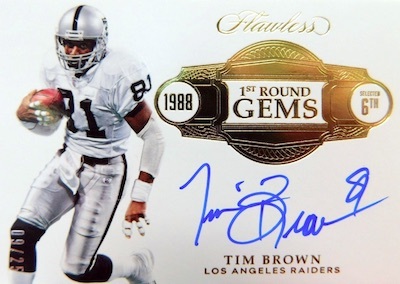 In addition, one of the new options is the hard-signed Rookie Gems Signatures set (#/20), which matches the parallels for the base gemstones. 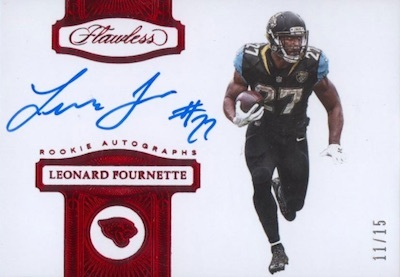 Of course, this is just the start of the signed cards in the 2017 Panini Flawless Football checklist that packs six autographs per box. 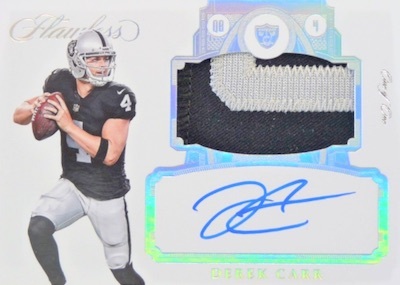 RPA fans have a fresh assortment of first-year stars to drool over within the Rookie Patch Autographs line (#/25). Displaying a moderate swatch and on-card signature, collectors can also be on the lookout for low-numbered parallels: Silver (#/20), Ruby (#/15), Sapphire (#/10), Emerald (#/5) and Platinum (1/1). 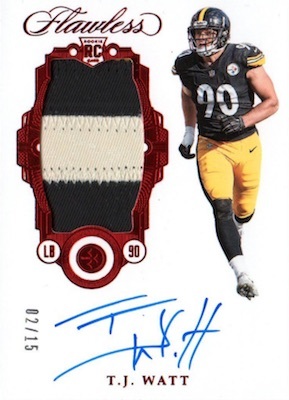 Flipping to a horizontal layout are auto relic inserts like Patch Autographs, Dual Patch Autographs and the all-new Signature Gloves. Also debuting in 2017, Shield Signatures (and the Symbolic Signatures parallel) incorporates brand logos and NFL shield relics. 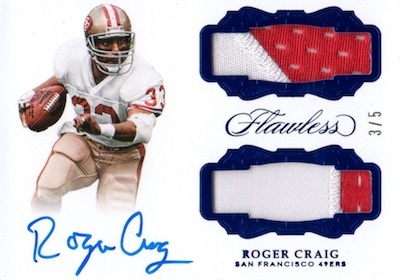 Other options include Flawless Signatures, Retired Numbers Autographs and Flawless Penmanship, which features all-time greats like Peyton Manning and Brett Favre. 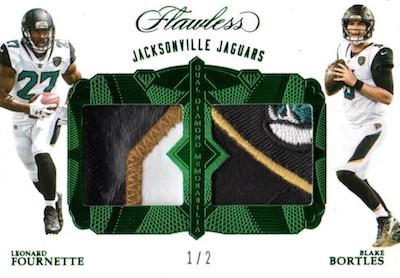 Filling the other two spots in each box of 2017 Panini Flawless Football, the relic quality mirrors the four-figure box price. Flawless Shields and Flawless Symbols are two of the new sets. 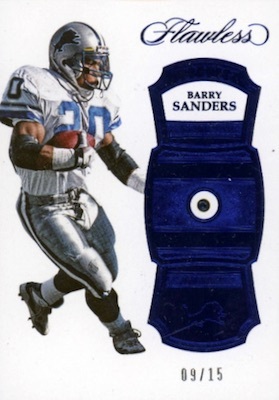 There's also Dual Diamond Memorabilia. Putting three top players on one card, the Triple Patches insert is numbered to no more than 20 copies. 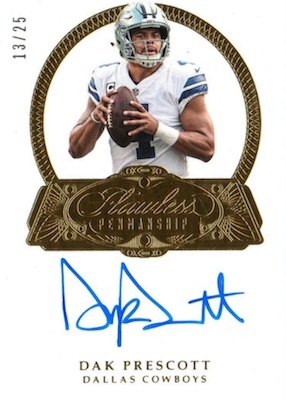 2017 FLAWLESS FOOTBALL DAK PRESCOTT PATCH AUTO COWBOYS No.PA-DP 2 5!!! 2017 PANINI FLAWLESS REGGIE WAYNE MIAMI HURRICANES AUTO AUTOGRAPH BLACK 1 1! 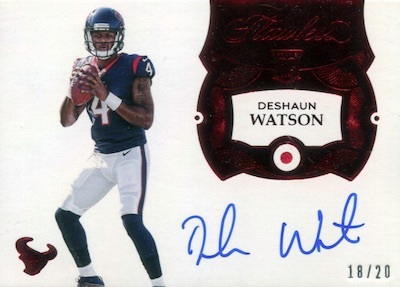 See the available 2017 Flawless NFL cards on eBay. 130 cards. Serial numbered #/15. PARALLEL CARDS: Sapphire #/15, Diamond #/10, Emerald #/5, Chocolate Diamond #/4, Canary Yellow Diamond #/3, Platinum 1/1. 20 cards. Serial numbered #/20. PARALLEL CARDS: Silver #/20 or #/15, Ruby #/15 or #/10, Sapphire #/10 or #/5, Emerald #/5 or #/3, Platinum 1/1. 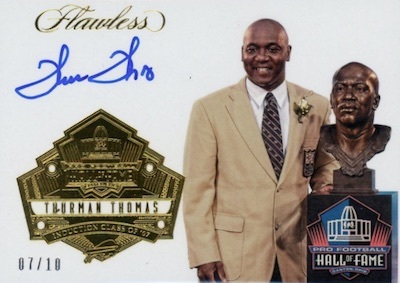 PARALLEL CARDS: Silver #/20 or less, Ruby #/15 or less, Sapphire #/10 or less, Emerald #/5 or #/2 (No Coleman*), Platinum 1/1. PARALLEL CARDS: Silver #/20 or less, Ruby #/15 or less, Sapphire #/10 or less, Emerald #/5 or #/2, Platinum 1/1. PARALLEL CARDS: Silver #/20 or less, Ruby #/15 or less, Sapphire #/10 or less, Emerald #/2, Platinum 1/1. PARALLEL CARDS: Silver #/20 or less, Ruby #/15 or less (No Coleman*), Sapphire #/10 or less, Emerald #/5 or #/2, Platinum 1/1. PARALLEL CARDS: Silver #/20 or less, Ruby #/15 or less, Sapphire #/10 or less, Emerald #/2 (Kelly #/5*), Platinum 1/1. PARALLEL CARDS: Silver #/20 or #/5, Ruby #/15 or #/5, Sapphire #/10 or #/3, Emerald #/5 or #/2, Platinum 1/1. PARALLEL CARDS: Silver #/20 or less, Ruby #/10 or #/5, Sapphire #/5 or #/3, Emerald #/2, Platinum 1/1. 57 cards. Serial numbered 1/1. 54 cards Serial numbered 1/1. PARALLEL CARDS: Silver #/15 or #/10, Ruby #/10 or #/5, Sapphire #/5, Emerald #/3 or #/2, Platinum 1/1. PARALLEL CARDS: Silver #/15 (Alstott #/10; Ray Lewis #/2*), Ruby #/15 or less, Sapphire #/10 or less, Emerald #/3 (Ray Lewis 1/1*), Platinum 1/1. PARALLEL CARDS: Silver #/10, Ruby #/10 or #/5, Sapphire #/5, Emerald #/3, Platinum 1/1. View the 2017 Panini Flawless NFL checklist spreadsheet. So no Tom Brady autos. What’s the point then? Chris, you’re full of crap. Hang up on yourself. No one is going after the gems. It’s the RC, sick patches, auto’s and SSP . This is an amazing product and very popular. Also , a ” Rich Lawyer ” makes only $2500 a week? Chris, you’re an idiot. Stick with Score buddy. Every card numbered /25 or less, so we already know you’re full of it. I bought into a random break for this last year and got one of the gem cards(not a star player either), My spot was $60 and sold the card for $38. $60 to me is a fair risk given the box sells for $1400+ for 10 cards giving a msrp value per a card $140. I think my $60 was worth the risk for the half the price of one cards msrp value given. Can’t even get Brady to sign this year either, tisk tisk. All I can say to Chris is: GO FOR BROKE! A little late in the season, and 1 week after NT release is a total fail. All sigs are on card, nice. Way too much player worn garb and not enough game used. Opened 4 cases and not impressed but nowhere near dissapointed either. It is as advertised. Had 5 1/1 cards, lots of good veteran cards and even one rookie hot case with 14 of the 20 cards being rookies. 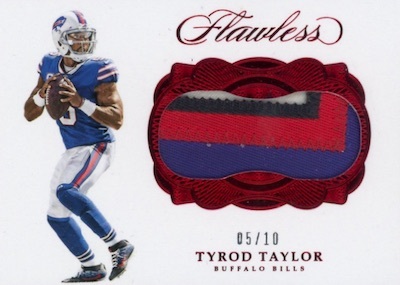 The real main flaw with flawless is the player worn items, and letting smudged autos into the product. Minor flaw is the introduction of 1500+ previous years cards. There are a hand full like LT and JB that would make you smile to own, but overall 90% would make you salty to get in the 2017 release. Really pleased to see Panini step up and limit that cheater Brady cards to 3 total, way to be Panini. Panini gets 5 stars, flawless gets 4.